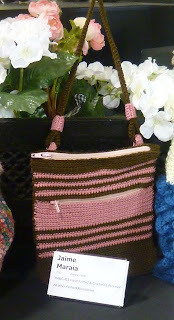 I entered my striped crossbody bag in the fair this year, which kinda makes me giggle every time I say it. My dad entered some of his paintings, so I got all inspired and entered my bag. Plus, the entry fee was only $5 and it came with a free ($11) ticket to the fair, so to me it was too good of a deal to pass up. I wasn't really invested in actually winning anything. 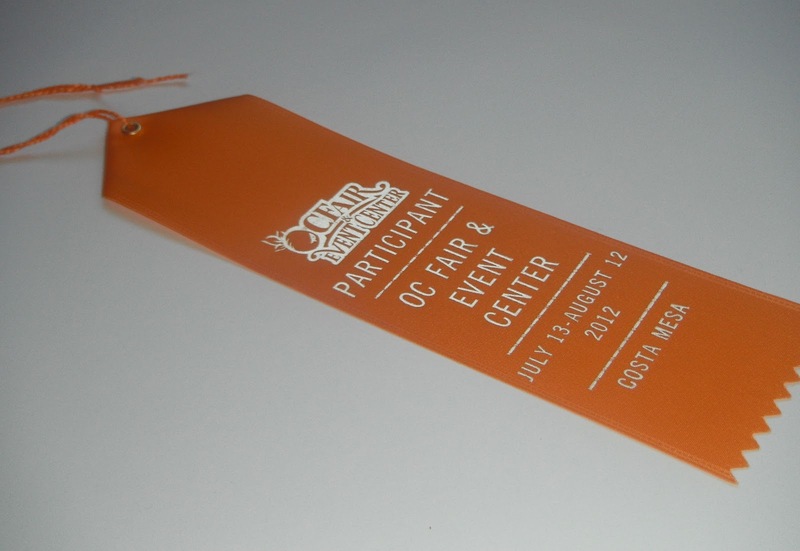 It was a pleasant surprise when I got my entry packet at the registration drop-off to have already received an awesome screaming bright orange Participant ribbon. 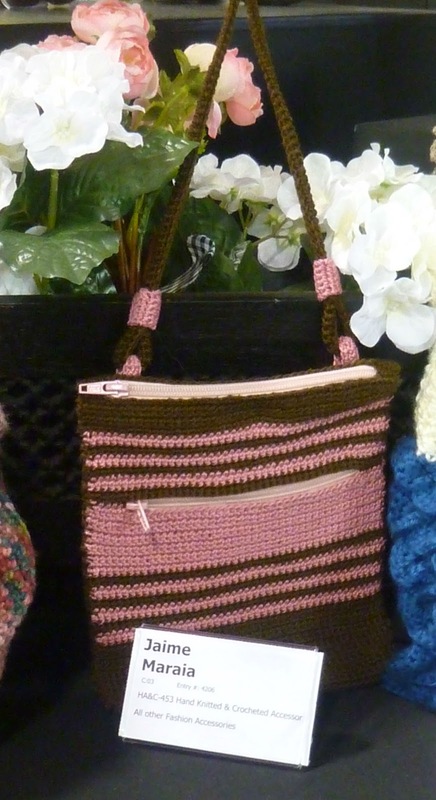 We went to the fair today to go see my bag. I almost didn't see it, it was kinda tucked in a corner. I'm glad I didn't plan on winning, since the bag that won in our division was a vintage beaded knit design with the flippin' tiniest thread ever. It totally deserved the win... I am going to have to up my game for next year! LOL!!! The stars are on both sides, since I didn't want my sewing stitches to show through. I got a lovely surprise when I dropped the pennant off at the front gate. I had apparently gotten registered in time to get a free ticket for participating! So, Jake and I used my two (2!!) free tickets, and since Mims is 5 she got in free anyway. 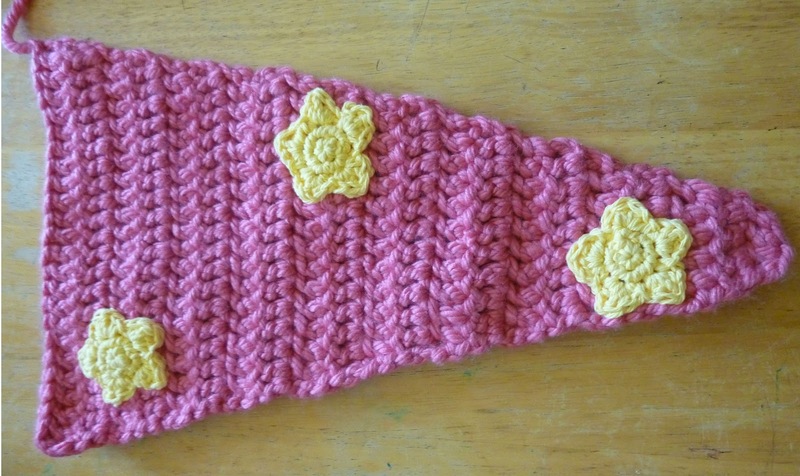 Yay for Yarn!!! 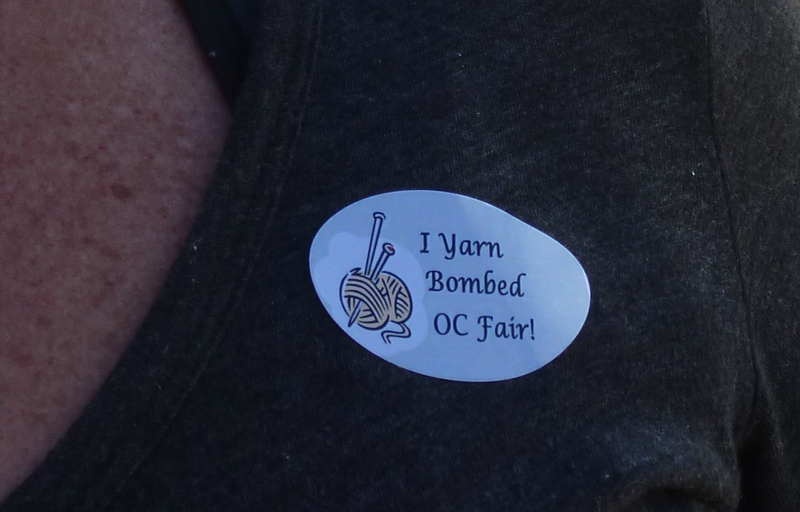 I was also super excited to get my awesome sticker! 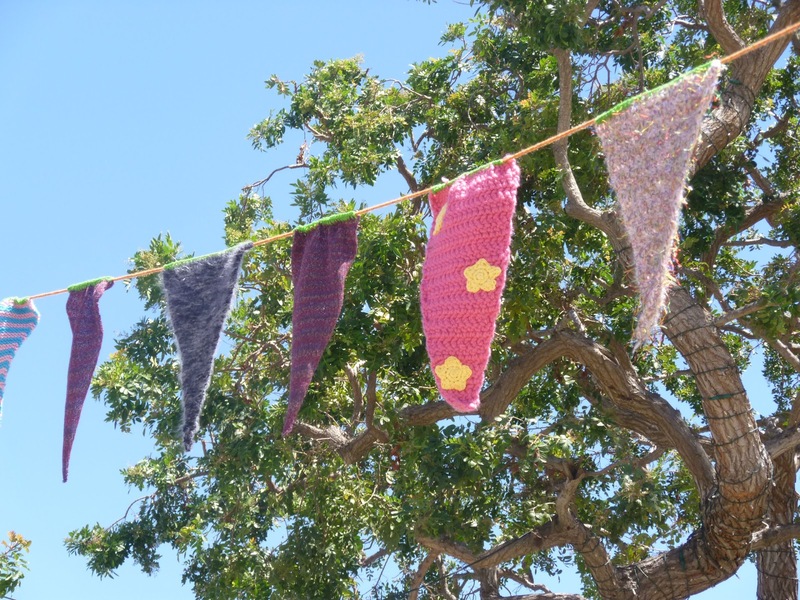 It was fun to see the yarn bombing groups working in the main square of the fair. They were working like crazy to get all the pennants stitched together. They had created really colorful and fun covers for the benches in the square, and they had covered two cow and pig sculptures nearby. We had to wait around for a couple of hours for my pennant to make it on to a garland and get hung in the trees. So we went to check out the Fine Art Pavillion where we saw that my dad had received an honorable mention for one of his pen and ink pieces! Then we shared a funnel cake. Finally, we checked back with the yarn bombing group and my pennant was with the group that was going up into the trees. I was so excited when I watched it being hung up. Sounds like you had a blast, wish I could have been there. Your bag looks brilliant. I think we had more fun because we got in free. We weren't invested in 'getting our money's worth' out of the day. Plus, it's always a good day when you get funnel cake... ♥ <-- Love that!!!! Hi Karen! LOL!!! 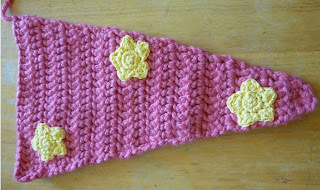 I love the idea of a crochet flight helmet... That's going on the to-do list now, I can't get the idea out of my head! No, shamefully I was so self-involved that it didn't occur to me to shoot other pictures until we were on our way home... In fact, I didn't even shoot a picture for my dad of his ribbon. I blame the heat... LOL!!! Jake is right! And when that helmet gets posted I will shamelessly adapt it to go over my Corgi's ears and embarrass him in front of all his friends. Rad! My brother-in-law has Corgis! Maybe I can borrow them and make matching Corgi/Owner helmets... Then you would HAVE to send in a picture, Karen!! !